About 6 parts to this series. Most important to note is that some companies set up improved relationships 30 years ago and that way back in 2004 everyone got a heads up that development wouldn’t be able to steamroll over indigenous lands anymore. Last edited by KC; 22-12-2018 at 06:24 AM. Last edited by KC; 22-12-2018 at 06:26 AM. “It’s about jurisdiction over the band’s territory. He said the deal – and he credits Kinder Morgan for being “very transparent” throughout the negotiations – gives the community environmental oversight, including the ability to hire its own engineers to work on the pipeline. 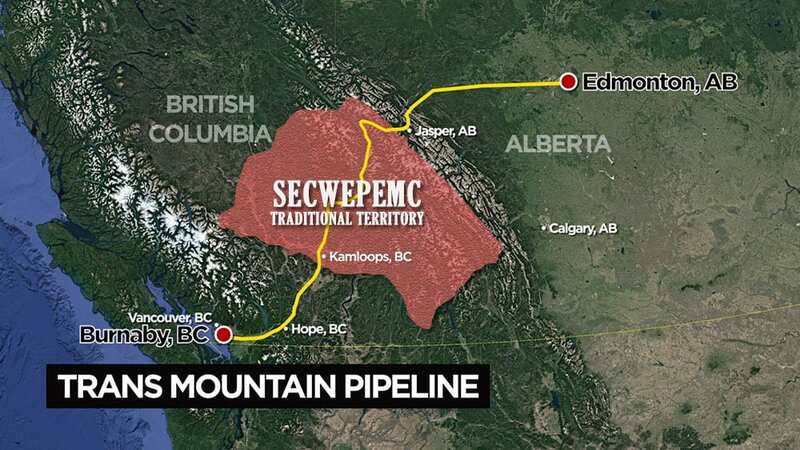 Nicole Schabus, an assistant law professor at Thompson Rivers University in Kamloops, says while about half the Trans Mountain pipeline route crosses through Secwepemcul’ecw – the unceded territory of the Secwepemc people – Canada has never obtained their free, prior and informed consent. She says when Kinder Morgan suspended non-essential spending they pointed to the province of B.C. for the hold-up. “But the biggest uncertainty, legal and economic, comes from Indigenous peoples,” Schabus said. The Trans Mountain pipeline was built in 1953, at a time when Indigenous people couldn’t legally organize around the question of land title and jurisdiction, Schabus explains. Since then multiple Supreme Court of Canada decisions have strengthened Indigenous Peoples’ land rights, title and jurisdiction in decision-making processes about what happens on their unceded territories where no treaties exist that give title to the Crown. “But do both the elected chiefs and the hereditary chiefs speak for the group as a whole? Or does one take precedence? Elected chiefs were created out of the Indian Act of 1876 by colonialists who came to North America, seized Indigenous Land and attempted to put their own system into place. The act created the elected chief and council system. These representatives are subject to elections held every two years. "It's incredibly simple," says Grand Chief Stewart Phillip, with the Union of B.C. Indian Chiefs when asked about the differences. "Band councils have authorities, powers and jurisdiction on the reserve land base itself. And where the border of the reserve ends, so ends their power and jurisdiction." Last edited by KC; 10-01-2019 at 05:50 AM. The minister was caught misspoking - consultations may be back on soon. Funny how people everywhere seem to want to be consulted. There was a strong backlash, both online and in the form of a rally in Drayton Valley on Monday, where protesters voiced anger over what they called a lack of proper consultation. Last edited by KC; 10-01-2019 at 06:01 AM. In addition to opposition from the hereditary chiefs of Wet'suwet'en Nation, the proposed Coastal GasLink natural gas pipeline faces another battle that TransCanada says could put the project at risk.The National Energy Board (NEB) launched a multi-step process last fall to determine whether the $4.8-billion pipeline should fall under federal jurisdiction and perhaps undergo further regulatory review — ​potentially delaying the project for months. The 675-kilometre pipeline, which would move natural gas from Groundbirch, B.C., to Kitimat, B.C., for international export was cleared by provincial officials by April 2016. It is owned by TransCanada Corp., now officially known as TC Energy. It's somewhat emotionally satisfying to see BC Premier John Horgan possibly hung up on his own petard. On the other hand, the Shell LNG project also benefits Alberta by off-shoring some Northeastern BC natural gas to Asian markets, rather than having it flow through our province adding to the already glutted North American market. Should Albertans boycott B.C. travel over pipeline spat? Last edited by KC; 14-04-2019 at 09:45 AM. Just finished my engineering program. That project is in my crosshairs as I landed a job in the LML. Here’s to hoping both provinces can thrive together. How do Vancouver’s, Victoria’s etc landfills compare with those in Alberta? The daily volumes might be a sign as to the amount of wasteful bad-for-the-environment consumption occurring in each jurisdiction. Last edited by KC; Yesterday at 08:41 AM.